Sliding a big salmon up the shingle beach by the tail at the Rangitata River mouth. 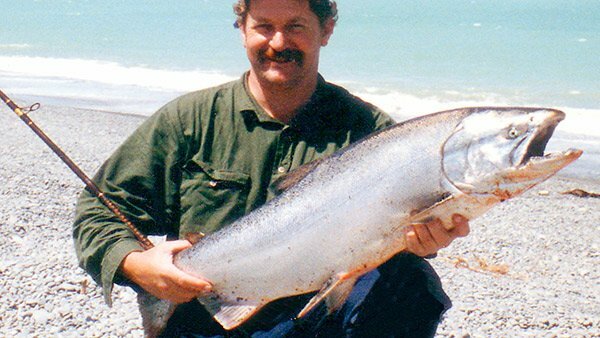 Many anglers regard the Rangitata River as the best salmon fishing river in the South Island. The ‘Rangi’ as it is affectionately known, is a relatively small river with midsummer flows mostly well under 100 cumecs (cubic metres per second). 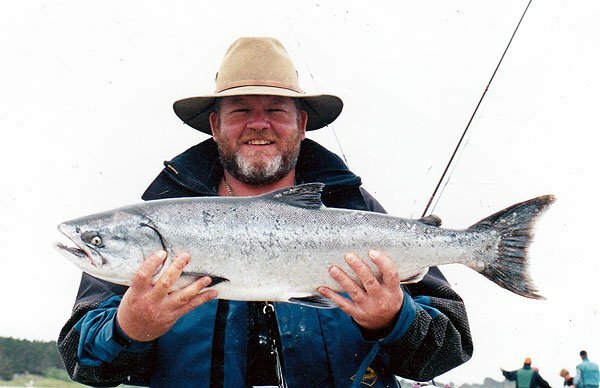 However, it is much favoured by salmon anglers, particularly the surf on the south side of the river mouth, which provides possibly the most consistent salmon fishing of all. 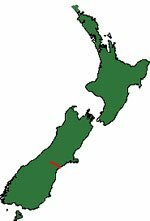 The Rangitata is a typical Canterbury Plains braided shingle river about 120 km in length. The Rangitata Rivers enters the sea 30 km north-east of Timaru. When the salmon are running at the mouth of the Rangitata River there is no better place in the world for an angler to be. Often there will be dozens of fish caught in the surf and in the gut at the top of the tide. Spin fishing for quinnat salmon at the mouth of the Rangitata River, South Island, New Zealand. 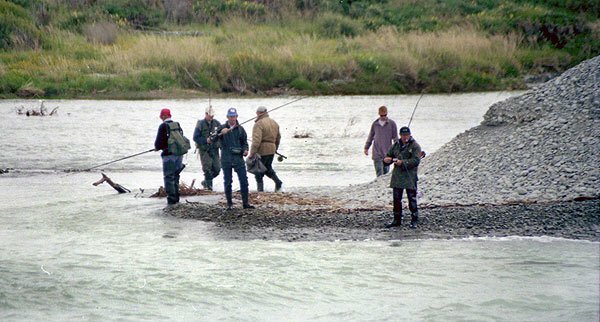 The Rangitata River offers consistent surf fishing. With the river often running low in summer the salmon congregate in the surf. 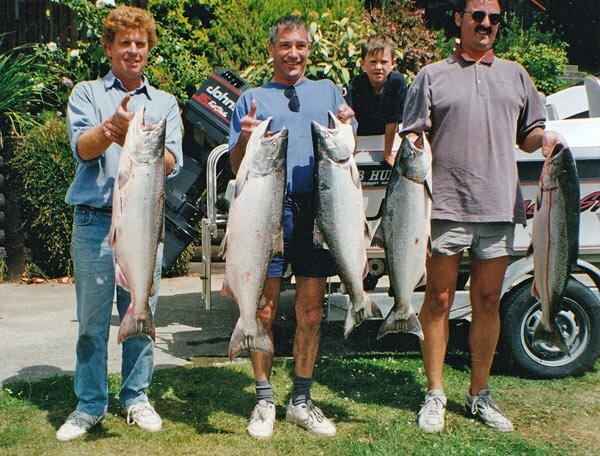 The salmon are often caught well out in the Rangitata River surf meaning the best casters are at an advantage. The surf generally fishes best for salmon at low tide when anglers can get their ticers further out. Salmon caught in the surf at the mouth of the Rangitata River. 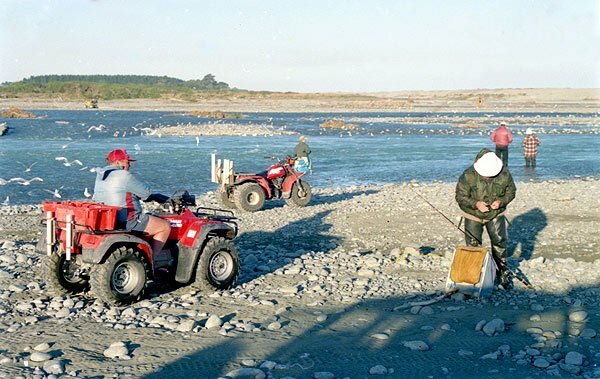 According to Colin Tipper who, together with his wife Brenda, run the Rangitata Reserve Motor Camp (south side), there are two distinct runs of salmon into the river. The first is early in the season during November, and the second takes place after Christmas, peaking at the end of January and early February. Update; the Rangitata Motor Camp is now run by Colin Wilson. Colin is a great bloke and a keen salmon angler. The phone number for the Camping ground on the south side of the Rangitata River mouth is at the bottom of this article. The Rangitata River gut is generally shallower and easier to fish than the bigger rivers. It fishes best on an incoming tide. Salmon caught off the Rangitata River mouth by boat out of Timaru. From left, Murray White, Maurice Buchanan, and John Patterson. They are all very solid fat looking salmon. Well done! 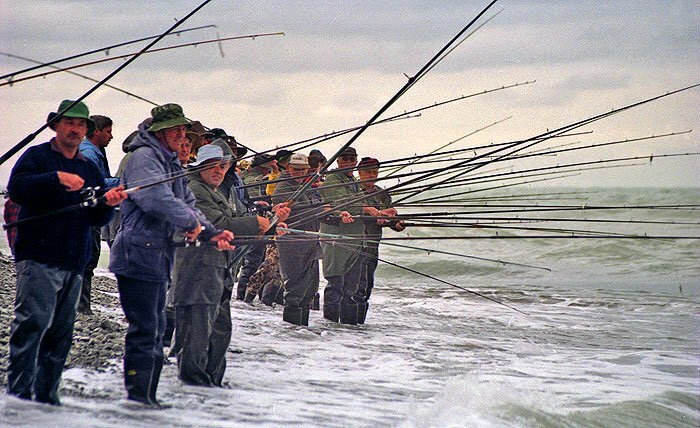 Long rod salmon/surf anglers crowd the point where the river flows into the sea on the south side of the Rangitata River mouth. 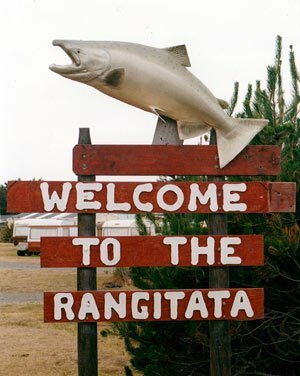 In the past, I have only fished the Rangitata a few times preferring instead to fish closer to my home in Christchurch. After all, anyone travelling south from Christchurch to fish the ‘Rangi’ has to pass over another salmon river that has a pretty good reputation itself: the mighty Rakaia. 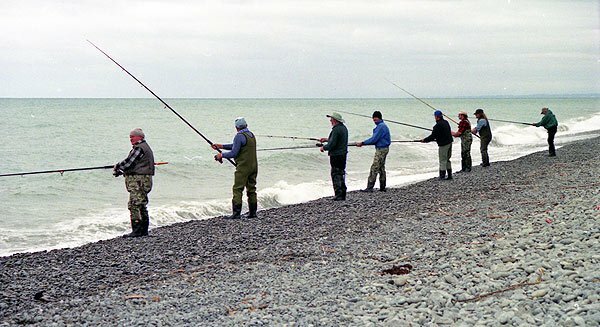 The main reason Christchurch anglers pass over the Rakaia River on their way to the Rangitata without even stopping for a cast is that the Rangitata surf is often fishable and producing when everywhere else is not. A bit further down the beach on the south side of the river mouth, the line has thinned out a little. Anglers on the north side of the mouth have fewer options when the spit on the southern side over-laps the northern side. Here they are fishing the gut – Rangitata River mouth. When staying at the camping ground on the south side of the mouth in early January I was quite surprised to see fish being caught in the surf despite the river being in flood with whole willows floating by. By the evening of the 6th, the surf was also dirty and unfishable. More surprising still was that by the following morning the surf on the south side was again clear and blue. The overnight southerly had pushed the dirty water north of the mouth and the surf produced around a dozen fish at lunchtime. Fishing the lower Rangitata River. You can tell there is plenty of smelt in the river by the huge numbers of birds present. 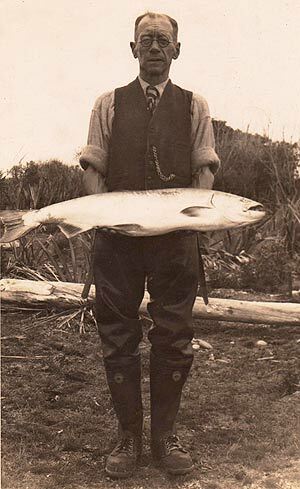 This 20 lb quinnat, or chinook, salmon was caught on the 20th Jan 1951. That is just 46 years after salmon were successfully introduced into New Zealand. The first successful introductions were made into the Waitaki River. Salmon tend not to be caught right throughout the day in the surf, but rather in spurts of a dozen or more over a relatively short two hour period. There will often be only a dozen or so anglers casting a line out over the breakers. When a fish is caught, suddenly and magically, a steady procession of farm bikes begin to stream down the shingle spit from the camping ground, and local baches, swelling angler numbers five-fold in a matter of minutes! 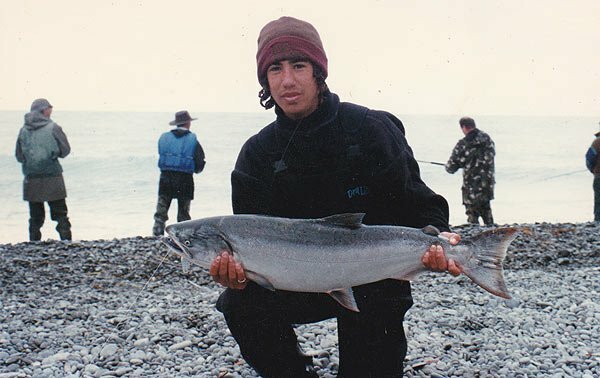 Kahawai schools often come in close to the river mouth and when in casting range much excitement is had. A week earlier I was at the mouth when one such school came within range of the blokes with really long casts. The sea was glassy calm. As seabirds screamed overhead a big mako tail-walked for a few seconds about 200 metres from the beach. It must have measured at least 2 metres in length, and no doubt had failed to apply its brakes early enough as it came roaring up from beneath the kahawai. To my mind, the trip was made worth the effort in that instant alone. Thinking back, not much had been happening all afternoon until the kahawai came into the beach and the birds began working, at which time there were hook-ups all over the place. Many of the kahawai were foul hooked and put up a tremendous fight before being released. The Rangitata River surf is the domain of the long distance caster. Long 12-foot graphite low mount rods and free spool casting reels are the preferred outfits, with 68g weight forward ticers the most popular terminal tackle. Though I noticed that some anglers were fishing yellow Grim Reaper and ThunderBolt Baitfish jigs. Hardly anyone fishes with plain silver ticers these days! Almost every surf angler applies their own prism tape in a colour combination they hope will give them the edge and encourage the salmon to bite! Of this material chartreuse (yellowish-green) is currently the most popular colour to use. Allan Burgess with a big salmon taken from the surf on the south side of the Rangitata River mouth. Salmon caught in the gut at the Rangitata River mouth. I am often asked the question “Is it necessary to have a long 12-foot rod to fish the surf?” The second question is “Why are they so expensive?” In answer to the first question, yes, a long rid is necessary if you want to cast a reasonable distance with a heavy ticer – up to 85g. It depends on the surf and sea conditions. 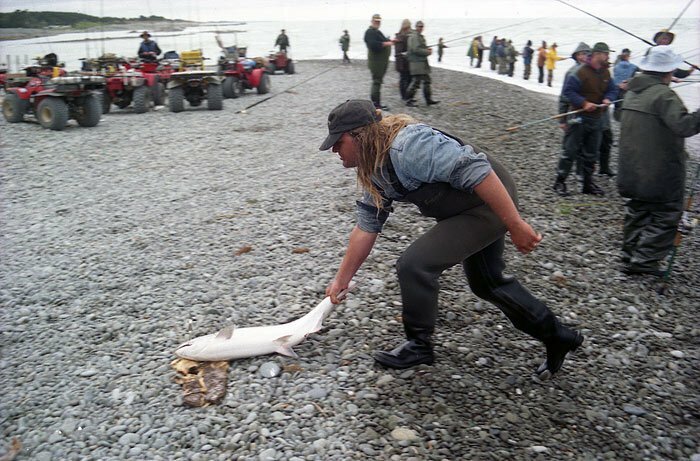 Sometimes salmon are taken very close to the beach – right in the last breaker. At other times, particularly when the surf is rough, only anglers who can cast a considerable distance will take salmon. The long rod will give you more options. P.J. 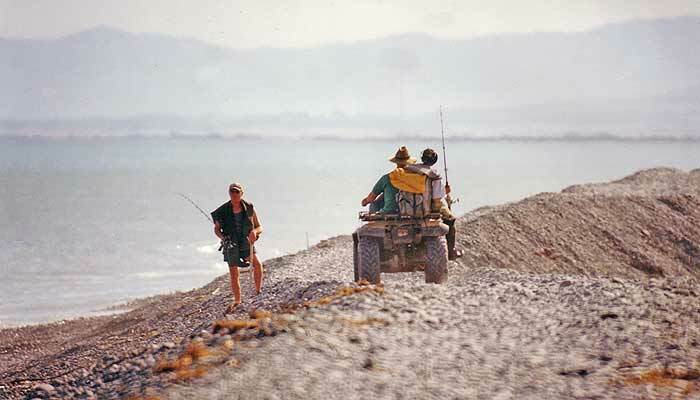 once run a tackle and bait store on the southern side of the Rangitata River mouth. He is a local identity, expert angler, and taxidermist. P.J. has fished all over the world! Sometimes the configuration of the river mouth is such that it is necessary to cast over the river to reach the surf behind it. In that situation, long distance casting comes into its own. On such days only those with the right gear and the knowledge to use it will take salmon! The reason the top of the range salmon/surf rods are quite expensive ($400-$800) is because they are mostly graphite. This makes them both light (around 13oz or 350g) yet stiff enough to be able to handle heavy ticers (68-85g). When casting for hours on end their light weight is a feature that is much appreciated. In recent years the trend has been to low-mount surf rods. These tend to act as a cantilever against the angler because of the way they are fished. When retrieving line onto the reel all the weight of the rod is taken by just one arm. With a low-mount long fibreglass rod, you need to be Superman if you are to fish for long periods. Top of the line graphite rods also tends to be narrow in cross-section and so displace less air during casting. This means more tip speed for less effort. Top quality rods are fitted with high-quality guides and reel seats that last a long time and offer top performance. 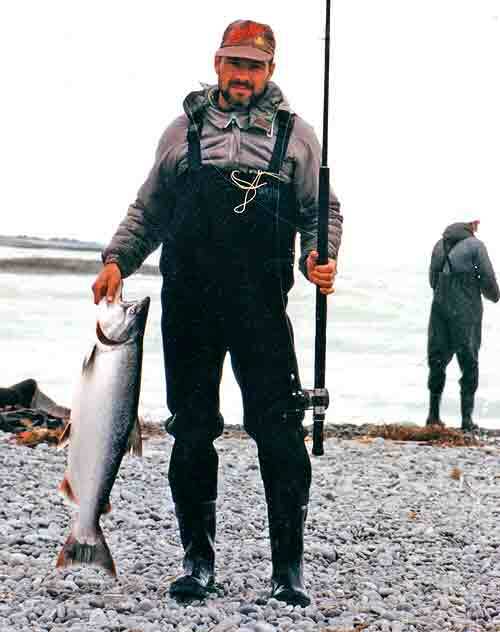 Another good sized salmon from the surf at the mouth of the “Rangi.” Note the low-mount reel position on the long rod. This is now standard. These are all important considerations for devoted surf anglers who prefer this type of salmon fishing. 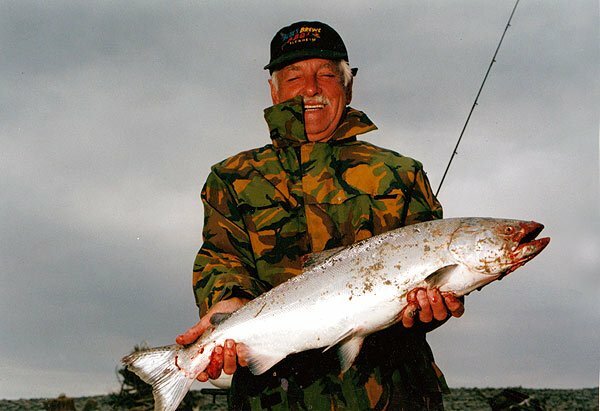 For the occasional salmon/surf angler a much less expensive 12-foot fibreglass rod and eggbeater reel will still catch any number of salmon from the surf, notwithstanding that it will take a bit more muscle to operate! In another update to this article it must be said that nowadays, 2015, most anglers are now fishing the surf with braided lines. These lines have little stretch so you can feel every touch on the line. Yet they have high breaking strain for their diameter allowing smaller reels that still hold the required 300 meters of line needed to fish the surf effectively. Everyone now fishes the surf with low-mount rods. 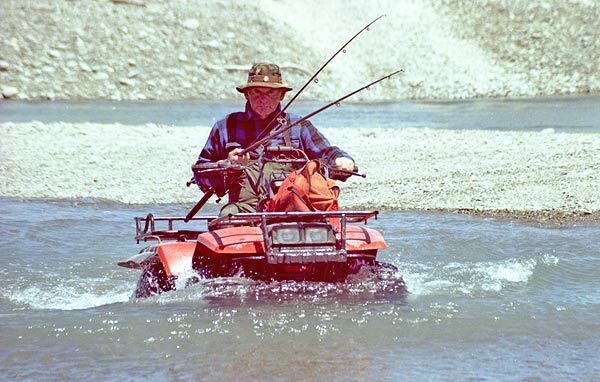 In fact, it would now be rare to see a salmon angler with a long rod that doesn’t feature a low-mount reel seat. The shapes of the big east coast salmon river mouths are constantly in a state of change and realignment. The spit on the south side of the Rangitata is currently very high and narrow. So narrow along a 200-metre section, in fact, that one farm bike must stop to allow the other to pass. Eventually, a good flood in the river will punch out a new opening and the mouth will move south. Last season the mouth of the Rangitata was hundreds of metres to the north. 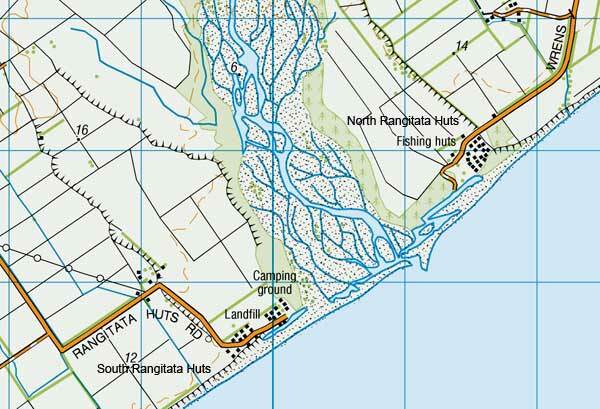 Rangitata River Mouth – North and South Rangitata Huts, South Canterbury – Map: 1:50,000. Each grid square represents 1 km. Maps Sourced from NZTopo50-BZ20. When I was there over the holidays the north side was a real dog’s breakfast of islands and spits, which meant that the surf on the north side couldn’t be fished at all on the top half of the tide. Some anglers on the north side, particularly bach owners, have got around this problem by using a small boat to get across to the south side. I prefer the south side of the Rangitata River mouth as the southerly drift generally gives more scope for fishing the surf. Transport down to the mouth of the “Rangi.” The old and the new method of getting there are shown well in this photograph. Walking over loose shingle is surprisingly exhausting especially if carrying a heavy load of fishing gear, food, drink, and warm clothing. At the mouths of the big Canterbury east coast salmon rivers, a shingle spit is formed by wave action. When the river floods following heavy rain in its catchment a new “mouth” is often punched in the spit. For this reason, the mouth proper can move back and forth by as much as five kilometres. This quad bike near the mouth of the Rangitata River seems able to handle being almost submerged as its rider crosses a braid to reach good salmon water. Quad bikes are also useful for launching small boats. Aside from the obvious attraction of the salmon and sea-run trout in the river, there is excellent surfcasting from the shingle beach directly in front of the camping ground. Huge hauls of red cod are caught here from time to time, along with yellow-eyed mullet, kahawai and various species of shark. My eldest son caught three very large red cod from the beach. We had these for lunch back at the tent. A slightly odd sensation to be eating what had been swimming only minutes earlier! Vast schools of what I guessed were kahawai were worked by thousands of birds some half a dozen kilometres off the coast the whole time we stayed at the camping ground. There are also very good catches made of elephant fish from the Rangitata surf. When conditions are right elephant fish are caught opposite the baches in good numbers. I have also witnessed some big sevengillers caught from the beach opposite the baches on the south side of the mouth.